We have thousands of properties for sale all over France. But we've no property for sale in Carnac at the moment. And that's something we want to change. If you have a property to sell in Carnac (or nearby) then act now to get a 50% discount. Just place your advert in the normal way (Click here to place your advert). Then send us an email quoting "Carnac" and telling us that you you saw this offer. 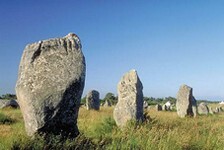 The town of Carnac, which is located in the gorgeous Morbihan department in southern Brittany, is noted not just for its lively seaside resort and charming old town, but for its spectacular standing stones or megaliths. Carnac is a pretty and interesting town in its own right, and makes a fabulous holiday destination for all ages, sheltered as it is in the Quiberon Bay. There is a charming old part to Carnac, known as Carnac Ville, which offers a beautiful long sandy beach, perfect for families and a little quieter than the beaches of Carnac Plage, which is the second part of Carnac and a modern resort. There are five beaches here in total. Both parts are pretty busy during the summer months, but if you can put up with the crowds it's a great time to be here, and in Carnac Plage particularly there is always something going on. There's a real buzz in the holiday season. The modern town is highly developed, and offers all manner of facilities and entertainment, so even if you have a mixed age crowd with diverse interests and tastes, there is likely to be something here to keep everybody happy. Carnac has a full range of shops and services, so you won't have any difficulty finding banks, cash points, post offices, tourist information and other necessities. There are plenty of leisure facilities too, and you can take your pick from a large number of excellent restaurants, fast food outlets, cafés and bars. Anyone with young children in tow can gain a little peace and quiet by enrolling them in the many children's clubs that the resort offers... strictly speaking these are aimed at holiday makers, but even if you live on the spot your child can be safely entertained in one of these clubs while you relax or enjoy a spot of retail therapy. There is a vast amount of sports and leisure activities that you can access from Carnac, and one of the most popular of these is cycling. It's a brilliant way to see the area, and the resort offers numerous cycle hire outlets with all manner of bicycles available... from the usual basketed "shopper" type, so typical of France, to tandems and even a full family creation that is great fun to try. Make sure they all pull their weight though... you don't want to be the only one pedalling! Other sports available locally include all sea and beach sports of course, pony trekking, golf, go-karting, walking, fishing, roller blading and paragliding. Close by is Saint Colomban, a picturesque ancient fishing village where granite stone-built houses surround a beautiful 16th century chapel. The Pô headland has several oyster farms, where you can just taste or indeed take away the excellent seafood. But Morbihan has so many places of interest that it is really worth hiring a car if you haven't brought your own and getting out to discover this magical part of Brittany. Allow at least a full day for exploring the prehistoric sites at Carnac, then hop into the car and take a look at the mediaeval town of Vannes, with its ramparts and half-timbered houses, or the pretty town of Auray. Discover miles of unspoiled coastline, with sparkling clean seas and beaches, and maybe take a boat trip to Belle Isle, or one of the numerous small islands that dot the ocean close to Carnac. You can fly to the airports of Lorient, Rennes, Brest or Dinard. Lorient is served by Aer Arann; Rennes by Aer Lingus and flybe; Brest by flybe and Ryanair; and Dinard by Ryanair and Aurigny. If travelling by ferry, the port of St Malo is the nearest, although all the northern ports are within a reasonable driving distance. Nearby Auray has a TGV stop so train travel is a very realistic alternative to flying. Travelling by car you should follow the N165 road, taking the Auray exit and following signs to Carnac from there. Morbihan property is sought after, and prices do tend to be a little more expensive than in other parts of Brittany. There's a good mix of old and new property types, however, and rental values are very good in Carnac as it's a popular holiday resort. Do you know Carnac better than we do? Do you have photos of Carnac? Carnac lies in the north-west of France in the south of the Morbihan department, on the coast. Access: By air: Fly into Lorient, Rennes, Brest or Dinard. By boat: The ferry ports of Brittany and Normandy are within easy reach. By road: The town is found from the D119 road. By rail: Nearby Auray has a TGV station. Economy: The main economy of the town is tourism.